Interesting VICE piece.. If nothing else I would like to go and have a look about Talad Yai.. These kind of oddball different schemes always interest me.. You see so many subsistence farmers, with land, all doing exactly the same thing as the neighbors.. So at harvest time everyone is harvesting at once, and theres a glut and awful prices (they are almost giving lamyais away here in season).. I recently read of a farang who set his missus up mushroom farming, a year or so in and their best day was 130 something kg of mushrooms at a wholesale of 50 baht a kg.. thats 8000 something baht in a day (costs of course) out of a couple of rai plot, just because its something very slightly unusual..
A rising chorus of chirping crickets greeted Aunt Jai as she lifted the blue mosquito netting off the concrete pens outside her house. Bubbling away with enthusiasm, she quickly pointed out every little detail of her modest cricket farm. “Those are the breeders… These are the young house crickets… There you can see some of their eggs, if you lift that cassava leaf…” For a 62-year-old, she is shockingly nimble, bouncing around between each of her 15 concrete pens, proudly showcasing the insects that have brought her so much success. 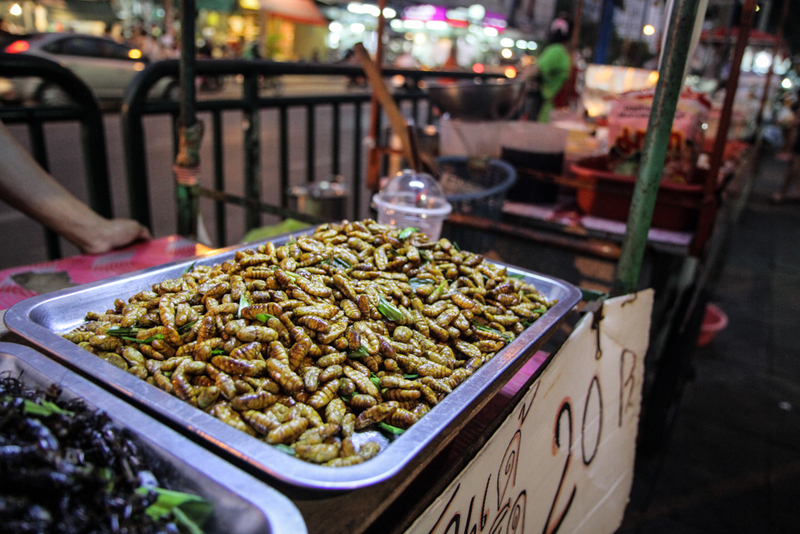 Thailand, like many countries, has a long history of eating insects, or what is called “entomophagy.” But while many of these countries have seen a decline in insect-eaters—due in no small part to insect-eating’s negative portrayal by the West—Thailand’s insect-eating community has actually grown and diversified beyond historical levels, thanks to a changing perception of insects as food. Today, Thailand is praised by the UN’s Food and Agriculture Organisation (FAO) as “one of the few countries to have developed a viable and thriving insect farming sector” with “more than 20,000 insect farming enterprises … registered in the country.” The sector now constitutes a multi-million-dollar frontier of farming; it is growing so quickly that it continues to outpace academic research and government oversight. 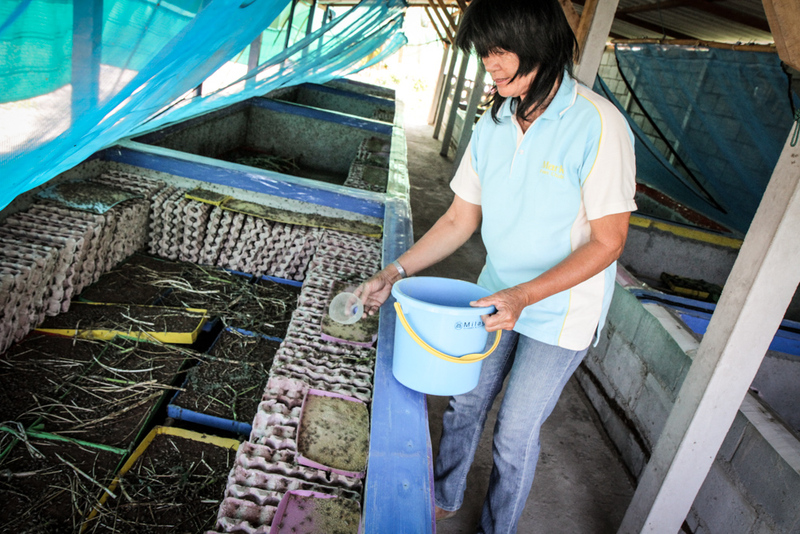 With only two years’ experience, Aunt Jai is among the new wave of Thais entering the insect-farming industry. Yet, unlike some other farmers, she was not aware of its potential, instead setting out with the simple goal of sating her daughter’s cravings. After receiving a small batch of various cricket eggs in the mail, Aunt Jai placed them in a small blue box and, having never been taught how to rear crickets, struggled to raise them through three months of trial and error. Eventually, she made her breakthrough and started rearing several cycles of crickets. Two months later, word of her crickets was spreading in her rural village near Don Chedi, just 80 kilometers northwest of Bangkok. Talad Thai, on the outskirts of Bangkok, is the country’s largest wholesale and retail market, located on nearly 200 acres of land. Walking amongst the hundreds of various wholesalers is a dizzying, glorious exposure to the sheer variety and quantity of foodstuffs available in Thailand. Mountains of pumpkins shade their wholesalers from the sun, while gourds, lemons, potatoes, and tomatoes line walkways. Onions, forests of green herbs, and bundles of garlic hang off tables. Omnipresent in the humid air is that subtle sting of dried chillies in water and vinegar. 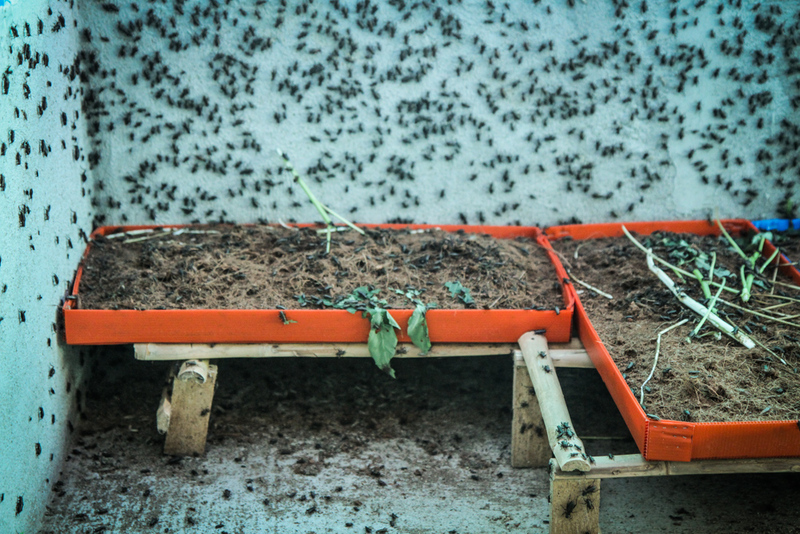 Talad Thai, and markets like it, are a common step in the supply chain of medium- to large-scale insect-farming enterprises. With this one-stop solution, farmers suddenly find it possible to sell in bulk to a wider consumer base. 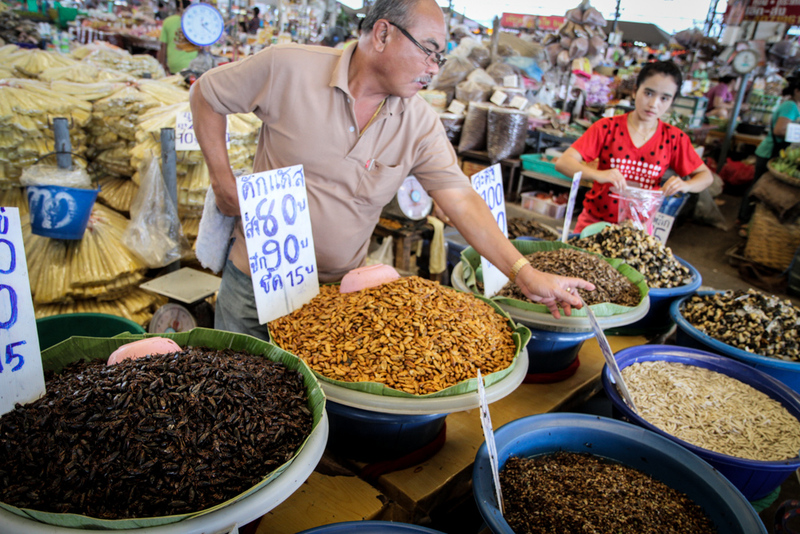 Talad Thai alone generates an average monthly income of over 300,000 THB ($9,150) per month through insects. 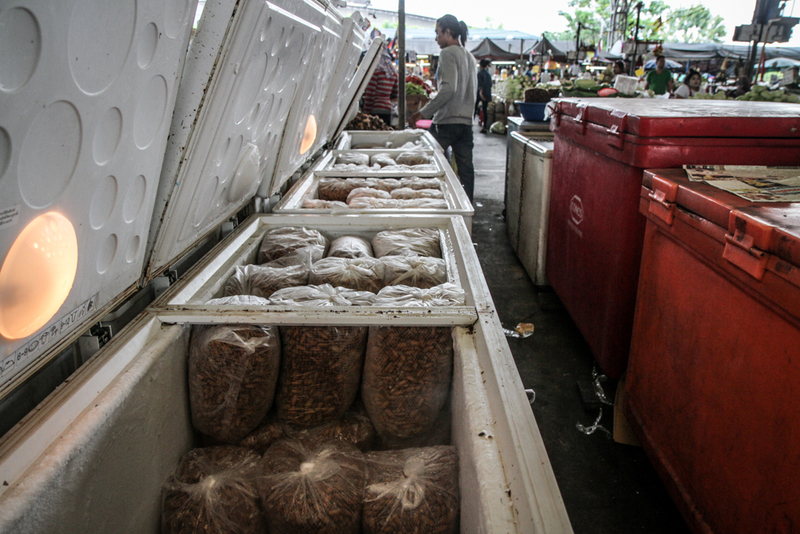 Tucked away in one area of the vegetables section is one of the market’s four insect wholesalers. Somnuek, a 54-year-old wholesaler of insects for nearly seven years, has little time to rest as he and his family work hard to serve their stream of customers. Gesturing to the glistening bowls of defrosting insects, Somnuek estimated that when he started his monthly profits were in the thousands. Now he always tops 100,000 THB ($3,050) per month. Thailand’s northeast Isan region, and to a lesser extent the more southern regions, have historically made up the bulk of the insect-eaters in Thailand. And while they may still constitute a majority of the consumer market, that base is quickly diversifying and expanding as attitudes change. 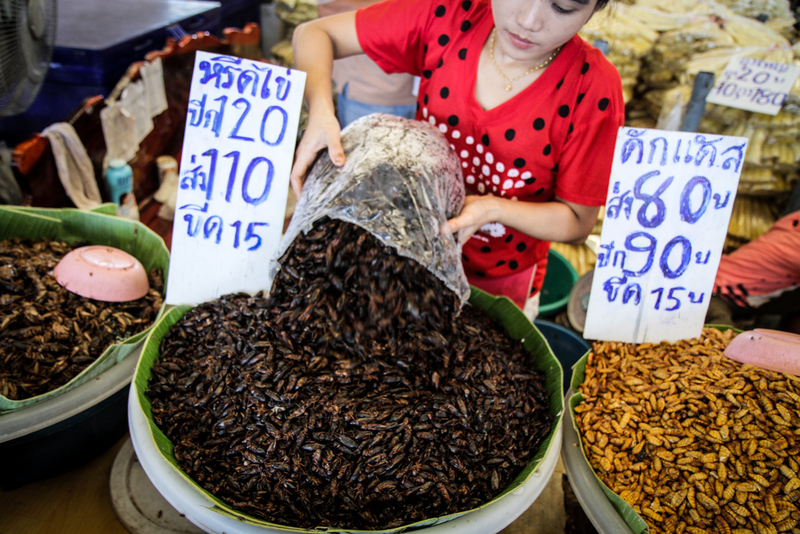 Dr. Yupa Hanboonsong, an associate professor of entomology at Khon Kaen University and a co-author of a 2013 FAO report on insect farming in Thailand, puts this change down to a recent effort in increasing the younger generations’ level of comfort with eating insects. The unnamed “pretty famous local actress” apparently bought a few kilos of one of the most prized insects —the bamboo caterpillar. In a nearby stall, these caterpillars were selling for 400 THB per kilo—four times the price of the house cricket. Only available seasonally through harvesting in the wild, the bamboo caterpillar is considered one of the more elegant insects to be seen eating, particularly in North Thailand. 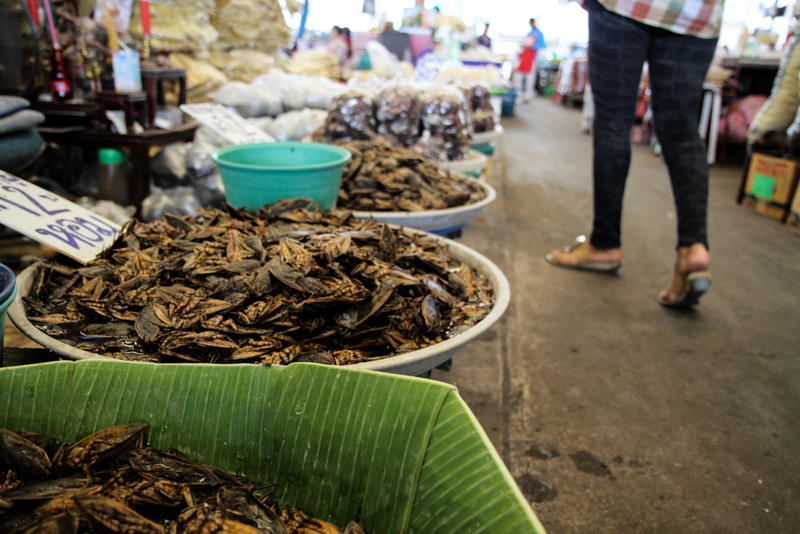 Although the FAO estimates that Thailand has some 200 edible species of insect, fewer than a dozen are regularly eaten. Hanboonsong explains that these insects can be subdivided into two groups: farmed insects (such as crickets and palm weevils) and wild-harvested (such as bamboo caterpillars, weaver ants and giant water bugs). While this is positive for the consumers in the short term, it also means that some farmers have an incentive to harvest at unsustainable levels when they are available. Even at the current rate of wild harvesting, populations of both the popular giant water bug and weaver ant eggs are declining. Ludo, a neighbor up in Buriram, does some cricket farming.